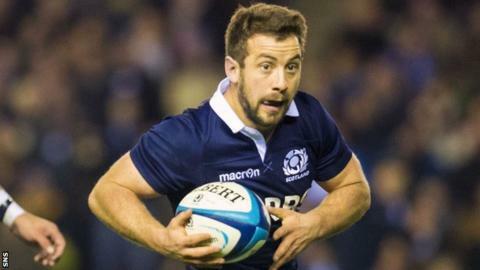 Greig Laidlaw will again captain Scotland at Murrayfield on Saturday and believes the All Blacks can be made to look ordinary. But only if the scrum-half's side execute their game plan perfectly. "England showed a couple of times that the All Blacks can come up with errors just like everybody else," Laidlaw said. "They are not superhuman. "But we are going to have to be at 100% to come anywhere close to winning the game." "Vern has given us the confidence to go and play and you saw that at the weekend. It is credit to him and his coaching staff for putting that performance together." Scotland have never beaten New Zealand in 29 attempts over 109 years but Steve Hansen's side were pushed close by England at Twickenham on Saturday before edging to a 24-21 win. The Gloucester scrum-half - handed the captaincy again while Grant Gilchrist continues his recovery from a broken arm - is taking heart from a sloppy first half and England's ability to "put a lot of good line-speed on New Zealand in their defence". "We in the Scotland team know how hard it is to go down to Twickenham and win," he said. "We are under no illusions. "But we have had a look at the tapes and come up with some things that can help us. "Hopefully that might do the trick. We will wait and see. "We have to be ready for whatever is thrown at us but we also have to be ready to have a go at them as well. "We have to try and put the All Blacks under pressure when we can." Scotland will also have gained confidence from last weekend's 41-31 win over Argentina in coach Vern Cotter's home debut. With orders to get the ball moving quicker from the breakdown, Laidlaw was the architect of two scores and added 14 points with the boot. "It was up there with my best performances in a Scotland jersey," the skipper said. "I was happy with how we all played. "We were a little bit disappointed with some of the tries we conceded but we scored 41 points and some nice tries and overall we were in control of the game, so we are happy. "Vern has given us the confidence to go and play and you saw that at the weekend. "It is credit to him and his coaching staff for putting that performance together. "But we have got our feet firmly fixed on the ground. We were extremely happy with the win over Argentina but it will be a different test altogether against the All Blacks."